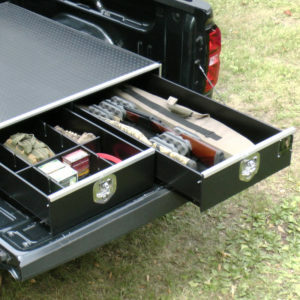 A safe and secure way to store your guns or weapons inside your vehicle, whether it be an SUV or a truck. Our Gun Rack In-Line Protectors are sold in 2 rack kits and are available in 3 gun or 5 gun models. GRIPs are constructed from MDF wood and covered in an ultra durable black vinyl. Between each upright there is carpet and foam lining either side. Simply place the stock end of your uncased shotgun or rifle in between the uprights on one rack and align the forend into the second rack. Note: Check with all applicable state authorities for firearm transportation laws.